Sorry, everyone, the movie will not be synched to Dark Side of the Moon— mainly because this collaboration with Henry Street Settlement, a local nonprofit community organization, is an expansion of Metrograph’s weekend matinees for kids. (For more adult fare, mosey over to the Free Films in Tompkins, which launched last night). The free screening starts at sundown (around 8pm), and moviegoers are encouraged to bring blankets, chairs, snacks, and, fine, an iPod playing Pink Floyd. 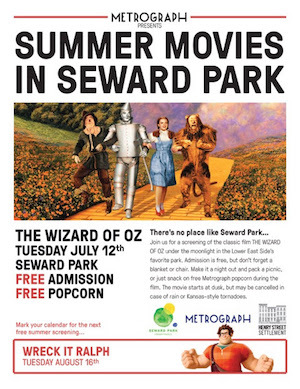 Michael Lieberman, Metrograph’s head of publicity, explained that this is the theater’s first foray into outdoor screenings, with another movie (Wreck It Ralph) planned for August 16. However, more films are likely to be added to the lineup in the summers to come. “I think this is certainly something we’ll continue doing,” Lieberman said.